This series outlines the most fundamental steps you can take with your investment in Microsoft 365 security solutions. Well provide advice on activities such as setting up identity management through active directory, malware protection, and more. In this post, we explain how to create a single common identity across on-premises and cloud with hybrid authentication. Establishing a single, common identity for each user is the foundations step to your cybersecurity strategy. If you currently have an on-premises footprint, this means connecting your Azure Active Directory (Azure AD) to your on-premises resources. There are various requirements and circumstances that will influence the hybrid identity and authentication method that you choose, but whether you choose federation or cloud authentication, there are important security implications for each that you should consider. This blog walks you through our recommended security best practices for each hybrid identity method. Azure AD Connect allows your users to access on-premises resources including Azure, Office 365, and Azure AD-integrated SaaS apps using one identity. It uses your on-premises Active Directory as the authority, so you can use your own password policy, and Azure AD Connect gives you visibility into the types of apps and identities that are accessing your company resources. If you choose Azure AD Connect, Microsoft recommends that you enable password hash synchronization (Figure 1) as your primary authentication method. Password hash synchronization synchronizes the password hash in your on-premises Active Directory to Azure AD. It authenticates in the cloud with no on-premises dependency, simplifying your deployment process. It also allows you to take advantage of Azure AD Identity Protection, which will alert you if any of the usernames and passwords in your organization have been sold on the dark web. Figure 1. 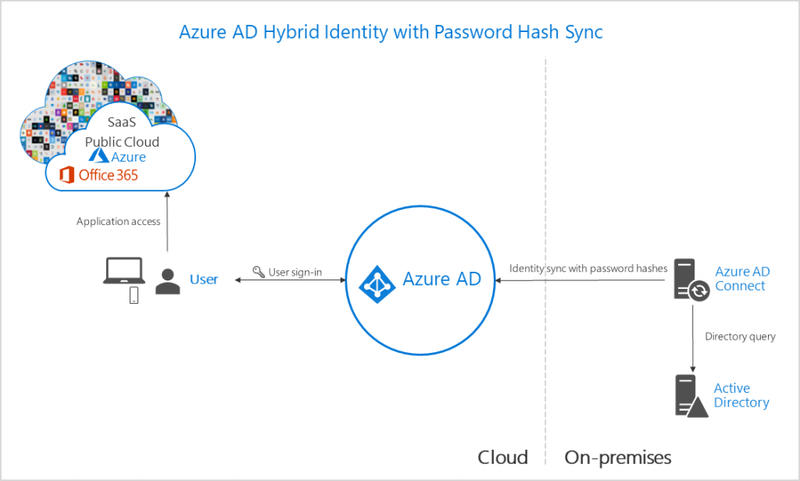 Password hash sync synchronizes the password hash in your on-premises Active Directory to Azure AD. If your authentication requirements are not natively supported by password hash synchronization, another option available through Azure AD Connect is pass-through authentication (Figure 2). Pass-through authentication provides a simple password validation for Azure AD authentication services by using a software agent that runs on one or more on-premises servers. Since pass-through authentication relies on your on-premises infrastructure, your users could lose access to both Active Directory-connected cloud resources and on-premises resources if your on-premises environment goes down. To limit user downtime and loss of productivity, we recommend that you configure password hash synchronization as a backup. This allows your users to sign in and access cloud resources during an on-premises outage. It also gives you access to advanced security features, like Azure Directory Identity Protection. Figure 2. 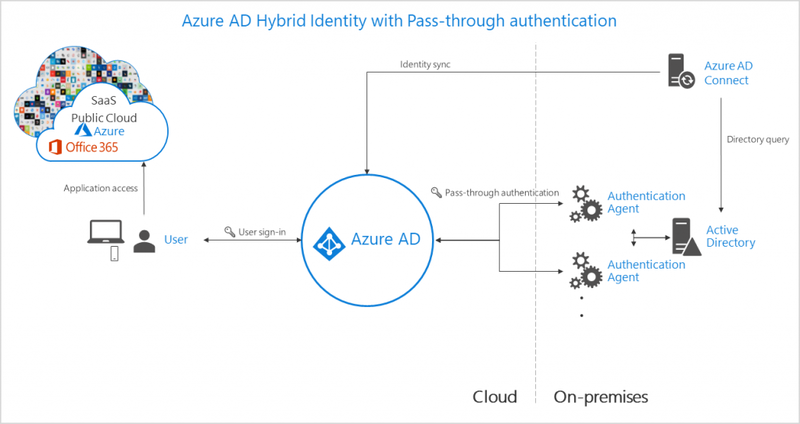 Pass-through authentication provides a simple password validation for Azure AD authentication services. Whether you implement password hash synchronization as your primary authentication method or as a backup during on-premises outages, you can use the Active Directory Federation Services (AD FS) to password hash sync deployment plan as a step-by-step guide to walk you through the implementation process. 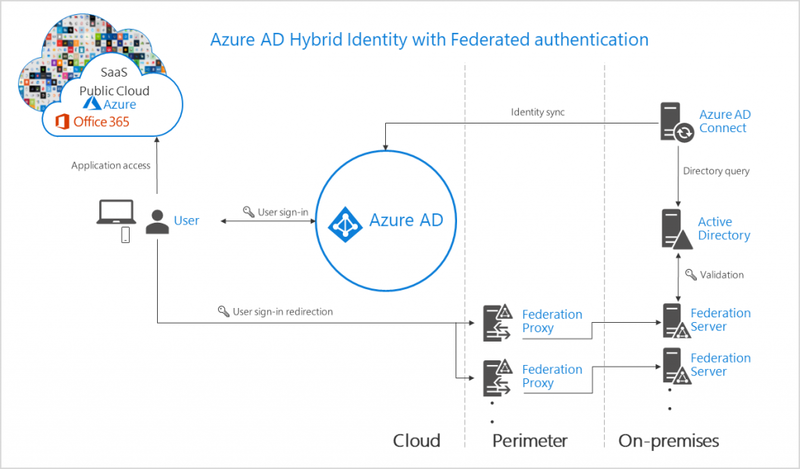 AD FS may be the right choice if your organization requires on-premises authentication or if you are already invested in federation services (Figure 3). Federation services authenticates users and connects to the cloud using an on-premises footprint that may require several servers. To ensure your users and data are as secure as possible, we recommend two additional steps. First, enable password hash synchronization as a backup authentication method to get access to Azure AD Identity Protection and minimize interruptions if an outage should occur. Second, we recommend you implement extranet lockout. Extranet lockout protects against brute force attacks that target AD FS, while preventing users from being locked out of Active Directory. If you are using AD FS running on Windows Server 2016, set up extranet smart lockout. For AD FS running on Windows Server 2012 R2AD, youll need to turn on extranet lockout protection. Figure 3. Federation services authenticates users and connects to the cloud using an on-premises footprint. You can use the AD FS to pass-through authentication deployment plan as a step-by-step guide to walk you through the implementation process. Check back in a few weeks for our next blog post, Step 2. Manage authentication and safeguard access. In this post well dive into additional protections you can apply to your identities to ensure that only authorized people access the appropriate data and apps. The post Step 1. Identify users: top 10 actions to secure your environment appeared first on Microsoft Secure.